VIPs in the stands during the Roscommon v Armagh All Ireland Senior Gaelic Football Semi Final Replay, 28th August 1977. 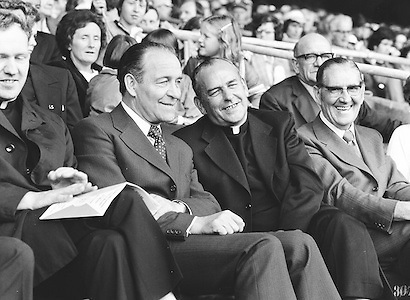 VIPs in the stands during the All Ireland Senior Gaelic Football Semi Final Replay Roscommon v Armagh in Croke Park on the 28th August 1977. Armagh 0-15 Roscommon 0-14.